Background radiation is the ionizing radiation present in the environment. Background radiation originates from a variety of sources, both natural and artificial. Sources include cosmic radiation, naturally occurring radioactive materials such as radon, and fallout from nuclear weapons testing and nuclear accidents. The term background radiation can have different meanings, depending whether we are considering an ambient radiation dose, or we wish to differentiate between an incidental background and a particular source of radiation of concern. For example, in considering radiation safety , background radiation is defined by the International Atomic Energy Agency as "Dose or dose rate (or an observed measure related to the dose or dose rate) attributable to all sources other than the one(s) specified. So a distinction is made between sources of dose which are incidentally in a location, which are defined here as being "background", and the dose due to a specified source. This is important where radiation measurements are taken of a specified radiation source, and the incidental background may affect this measurement. An example would be detection of radioactive contamination in a gamma ray background, which could increase the total reading above that expected from the contamination alone. However, if no specific radiation source is of concern, then the total radiation dose measurement taken at a location is generally called the background radiation , and this is usually the case where an ambient dose rate is measured for environmental purposes. Consumer items - 0.13 cigarettes, air travel, building materials, etc. Radioactive material is found throughout nature. Detectable amounts occur naturally in soil, rocks, water, air, and vegetation, from which it is inhaled and ingested into the body. In addition to this internal exposure, humans also receive external exposure from radioactive materials that remain outside the body and from cosmic radiation from space. The worldwide average natural dose to humans is about 2.4 millisievert (mSv) per year. 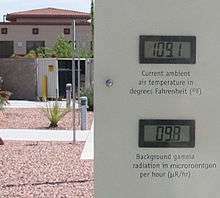 This is four times the worldwide average artificial radiation exposure, which in 2008 amounted to about 0.6 mSv per year. In some rich countries, like the US and Japan, artificial exposure is, on average, greater than the natural exposure, due to greater access to medical imaging. In Europe, average natural background exposure by country ranges from under 2 mSv annually in the United Kingdom to more than 7 mSv annually for some groups of people in Finland. Radiation exposure from radon is indirect. Radon has a short half-life (4 days) and decays into other solid particulate radium-series radioactive nuclides. These radioactive particles are inhaled and remain lodged in the lungs, causing continued exposure. 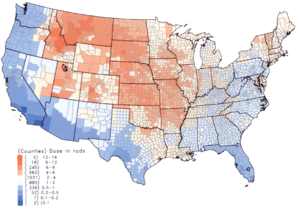 Radon is thus the second leading cause of lung cancer after smoking, and accounts for 15,000 to 22,000 cancer deaths per year in the US alone. Estimate of the maximum dose of radiation received at an altitude of 12 km January 20, 2005, following a violent solar flare. The doses are expressed in microsieverts per hour. The Earth and all living things on it are constantly bombarded by radiation from outer space. This radiation primarily consists of positively charged ions from protons to iron and larger nuclei derived sources outside our solar system. This radiation interacts with atoms in the atmosphere to create an air shower of secondary radiation, including X-rays, muons, protons, alpha particles, pions, electrons, and neutrons. The immediate dose from cosmic radiation is largely from muons, neutrons, and electrons, and this dose varies in different parts of the world based largely on the geomagnetic field and altitude. For example, the city of Denver in the United States (at 1650 meters elevation) receives a cosmic ray dose roughly twice that of a location at sea level. This radiation is much more intense in the upper troposphere, around 10 km altitude, and is thus of particular concern for airline crews and frequent passengers, who spend many hours per year in this environment. During their flights airline crews typically get an extra dose on the order of 2.2 mSv (220 mrem) per year. Terrestrial radiation, for the purpose of the table above, only includes sources that remain external to the body. The major radionuclides of concern are potassium, uranium and thorium and their decay products, some of which, like radium and radon are intensely radioactive but occur in low concentrations. Most of these sources have been decreasing, due to radioactive decay since the formation of the Earth, because there is no significant amount currently transported to the Earth. Thus, the present activity on earth from uranium-238 is only half as much as it originally was because of its 4.5 billion year half-life, and potassium-40 (half-life 1.25 billion years) is only at about 8% of original activity. The effects on humans of the actual diminishment (due to decay) of these isotopes is, however, minimal. This is because humans evolved too recently for the difference in activity over a fraction of a half-life to be significant. Put another way, human history is so short in comparison to a half-life of a billion years, that the activity of these long-lived isotopes has been effectively constant throughout our time on this planet. In addition, many shorter half-life (and thus more intensely radioactive) isotopes have not decayed out of the terrestrial environment because of their on-going natural production. Examples of these are radium-226 (decay product of thorium-230 in decay chain of uranium-238) and radon-222 (a decay product of radium-226 in said chain). Some of the essential elements that make up the human body, mainly potassium and carbon, have radioactive isotopes that add significantly to our background radiation dose. An average human contains about 30 milligrams of potassium-40 (40K) and about 10 nanograms (10−8 g) of carbon-14 (14C), which has a decay half-life of 5,730 years. Excluding internal contamination by external radioactive material, the largest component of internal radiation exposure from biologically functional components of the human body is from potassium-40. The decay of about 4,000 nuclei of 40K per second makes potassium the largest source of radiation in terms of number of decaying atoms. The energy of beta particles produced by 40K is also about 10 times that from the beta particles from 14C decay. 14C is present in the human body at a level of 3700 Bq with a biological half-life of 40 days. There are about 1,200 beta particles per second produced by the decay of 14C. However, a 14C atom is in the genetic information of about half the cells, while potassium is not a component of DNA. The decay of a 14C atom inside DNA in one person happens about 50 times per second, changing a carbon atom to one of nitrogen. The global average internal dose from radionuclides other than radon and its decay products is 0.29 mSv/a, of which 0.17 mSv/a comes from 40K, 0.12 mSv/a comes from the uranium and thorium series, and 12 μSv/a comes from 14C. The highest background radiation in an inhabited area is found in Ramsar, primarily due to the use of local naturally radioactive limestone as a building material. The 1000 most exposed residents receive an average external effective radiation dose of 6 mSv per year, (0.6 rem/yr,) six times the ICRP recommended limit for exposure to the public from artificial sources. They additionally receive a substantial internal dose from radon. Record radiation levels were found in a house where the effective dose due to ambient radiation fields was 131 mSv/a, (13.1 rem/yr) and the internal committed dose from radon was 72 mSv/a (7.2 rem/yr). This unique case is over 80 times higher than the world average natural human exposure to radiation. Epidemiological studies are underway to identify health effects associated with the high radiation levels in Ramsar. It is much too early to draw statistically significant conclusions. While so far support for beneficial effects of chronic radiation (like longer lifespan) has not been observed, a protective and adaptive effect is suggested by at least one study whose authors nonetheless caution that data from Ramsar are not yet sufficiently strong to relax existing regulatory dose limits. Most of the natural neutron background is a product of cosmic rays interacting with the atmosphere. 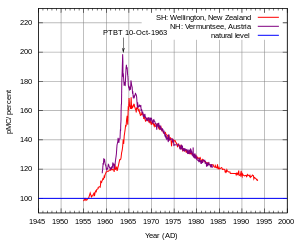 The neutron energy peaks at around 1 MeV and rapidly drops above. At sea level, the production of neutrons is about 20 neutrons per second per kilogram of material interacting with the cosmic rays (or, about 100-300 neutrons per square meter per second). 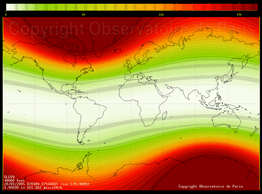 The flux is dependent on geomagnetic latitude, with a maximum at about 45 degrees. At solar minimums, due to lower solar magnetic field shielding, the flux is about twice as high vs the solar maximum. It also dramatically increases during solar flares. In the vicinity of larger heavier objects, e.g. buildings or ships, the neutron flux measures higher; this is known as "cosmic ray induced neutron signature", or "ship effect" as it was first detected with ships at sea. 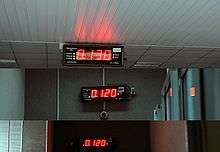 Displays showing ambient radiation fields of 0.120-0.130 μSv/h (1.05-1.14 mSv/a) in a nuclear power plant. This reading includes natural background from cosmic and terrestrial sources. A typical chest x-ray delivers 0.02 mSv (2 mrem) of effective dose. A dental x-ray delivers a dose of 5 to 10 µSv The average American receives about 3 mSv of diagnostic medical dose per year; countries with the lowest levels of health care receive almost none. Radiation treatment for various diseases also accounts for some dose, both in individuals and in those around them. Air travel causes increased exposure to cosmic radiation. The average extra dose to flight personnel is 2.19 mSv/year. Under normal circumstances, nuclear reactors release small amounts of radioactive gases, which cause small radiation exposures to the public. Events classified on the International Nuclear Event Scale as incidents typically do not release any additional radioactive substances into the environment. Large releases of radioactivity from nuclear reactors are extremely rare. To the present day, there were two major civilian accidents - the Chernobyl accident and the Fukushima I nuclear accidents - which caused substantial contamination. The Chernobyl accident was the only one to cause immediate deaths. Non-civilian: In addition to the civilian accidents described above, several accidents at early nuclear weapons facilities - such as the Windscale fire, the contamination of the Techa River by the nuclear waste from the Mayak compound, and the Kyshtym disaster at the same compound - released substantial radioactivity into the environment. The Windscale fire resulted in thyroid doses of 5-20 mSv for adults and 10-60 mSv for children. The doses from the accidents at Mayak are unknown. 1 2 3 4 5 United Nations Scientific Committee on the Effects of Atomic Radiation (2008). Sources and effects of ionizing radiation. New York: United Nations (published 2010). p. 4. ISBN 978-92-1-142274-0. Retrieved 9 November 2012. 1 2 3 Ionizing radiation exposure of the population of the United States. Bethesda, Md. : National Council on Radiation Protection and Measurements. 2009. ISBN 978-0-929600-98-7. NCRP No. 160. ↑ "Natural Radiation in western Europe". 1 2 United Nations Scientific Committee on the Effects of Atomic Radiation (2006). "Annex E: Sources-to-effects assessment for radon in homes and workplaces". Effects of Ionizing Radiation (PDF). II. New York: United Nations (published 2008). ISBN 978-92-1-142263-4. Retrieved 2 December 2012. ↑ Thomas, John J.; Thomas, Barbara R.; Overeynder, Helen M. (September 27–30, 1995). Indoor Radon Concentration Data: Its Geographic and Geologic Distribution, an Example from the Capital District, NY (PDF). International Radon Symposium. Nashville, TN: American Association of Radon Scientists and Technologists. Retrieved 2012-11-28. ↑ Upfal, Mark J.; Johnson, Christine (2003). "65 Residential Radon" (PDF). In Greenberg, Michael I.; Hamilton, Richard J.; Phillips, Scott D.; McCluskey, Gayla J. Occupational, industrial, and environmental toxicology (2nd ed.). St Louis, Missouri: Mosby. ISBN 9780323013406. Retrieved 28 November 2012. ↑ "Background Radiation & Other Sources of Exposure". Radiation Safety Training. Miami University. Retrieved 30 September 2016. ↑ "Radiation Exposure During Commercial Airline Flights". Retrieved 2011-03-17. ↑ Asimov, Isaac (1976) . "The Explosions Within Us". Only A Trillion (Revised and updated ed.). New York: ACE books. pp. 37–39. ISBN 1-157-09468-6. ↑ Nair, MK; Nambi, KS; Amma, NS; Gangadharan, P; Jayalekshmi, P; Jayadevan, S; Cherian, V; Reghuram, KN (1999). "Population study in the high natural background radiation area in Kerala, India". Radiation research. 152 (6 Suppl): S145–8. doi:10.2307/3580134. PMID 10564957. ↑ Zhang, SP (2010). "Mechanism study of adaptive response in high background radiation area of Yangjiang in China". Zhonghua Yu Fang Yi Xue Za Zhi. Europe PubMed Central. 44: 815–9. PMID 21092626. ↑ United Nations Scientific Committee on the Effects of Atomic Radiation (2000). "Annex B". Sources and Effects of Ionizing Radiation. vol. 1. United Nations. p. 121. Retrieved 11 November 2012. ↑ Freitas, AC; Alencar, AS (2004). "Gamma dose rates and distribution of natural radionuclides in sand beaches--Ilha Grande, Southeastern Brazil" (PDF). Journal of Environmental Radioactivity. 75 (2): 211–23. doi:10.1016/j.jenvrad.2004.01.002. ISSN 0265-931X. PMID 15172728. Retrieved 2 December 2012. ↑ Vasconcelos, Danilo C.; et al. (September 27 – October 2, 2009). Natural Radioactivity in Extreme South of Bahia, Brazil Using Gamma-Ray Spectrometry (PDF). International Nuclear Atlantic Conference. Rio de Janeiro: Associação Brasileira de Energia Nuclear. ISBN 978-85-99141-03-8. Retrieved 2 December 2012. 1 2 3 Hendry, Jolyon H; Simon, Steven L; Wojcik, Andrzej; Sohrabi, Mehdi; Burkart, Werner; Cardis, Elisabeth; Laurier, Dominique; Tirmarche, Margot; Hayata, Isamu (1 June 2009). "Human exposure to high natural background radiation: what can it teach us about radiation risks?" (PDF). Journal of Radiological Protection. 29 (2A): A29–A42. Bibcode:2009JRP....29...29H. doi:10.1088/0952-4746/29/2A/S03. PMC 4030667 . PMID 19454802. Retrieved 1 December 2012. ↑ Pattison, J. E.; Hugtenburg, R. P.; Green, S. (2009). "Enhancement of natural background gamma-radiation dose around uranium microparticles in the human body". Journal of the Royal Society Interface. 7 (45): 603–11. doi:10.1098/rsif.2009.0300. ↑ Hart, D.; Wall, B.F. (2002). Radiation Exposure of the UK Population from Medical and Dental X-ray Examinations (PDF). National Radiological Protection Board. p. 9. ISBN 0859514684. Retrieved 18 May 2012. ↑ Dade W. Moeller. "Doses from cigarette smoking". Health Physics Society. Retrieved 2013-01-24. ↑ Health Physics Society. "Radiation exposure during commercial airline flights". Retrieved 2013-01-24. ↑ "Atmospheric δ14C record from Wellington". Trends: A Compendium of Data on Global Change. Carbon Dioxide Information Analysis Center. Oak Ridge National Laboratory. 1994. Retrieved 2007-06-11. ↑ Levin, I.; et al. (1994). "δ14C record from Vermunt". Trends: A Compendium of Data on Global Change. Carbon Dioxide Information Analysis Center. ↑ "Radiocarbon dating". University of Utrecht. Retrieved 2008-02-19. ↑ "The 2007 Recommendations of the International Commission on Radiological Protection". Annals of the ICRP. ICRP publication 103. 37 (2–4). 2007. ISBN 978-0-7020-3048-2. Retrieved 17 May 2012. ↑ World Health Organization (April 2006). "Health effects of the Chernobyl accident: an overview". Retrieved 2013-01-24. ↑ Geoff Brumfiel (2012-05-23). "Fukushima's doses tallied". Nature. Retrieved 2013-01-24. ↑ U.S. Nuclear Regulatory Commission (August 2009). "Backgrounder on the Three Mile Island Accident". Retrieved 2013-01-24. ↑ "Radiological Consequences of the 1957 Windscale Fire". 1997-10-10. Retrieved 2013-01-24. ↑ McBride, J. P.; Moore, R. E.; Witherspoon, J. P.; Blanco, R. E. (Dec 8, 1978). "Radiological impact of airborne effluents of coal and nuclear plants" (PDF). Science. 202 (4372): 1045–50. Bibcode:1978Sci...202.1045M. doi:10.1126/science.202.4372.1045. PMID 17777943. Retrieved 15 November 2012. ↑ United Nations Scientific Committee on the Effects of Atomic Radiation (1988). "Annex A". Sources, Effects and Risks of Ionizing Radiation. New York: United Nations. p. 83. ISBN 92-1-142143-8. Retrieved 16 November 2012. ↑ Gabbard, Alex (1993). "Coal Combustion: Nuclear Resource or Danger?". Oak Ridge National Laboratory Review. 26 (3–4): 18–9. Archived from the original on 5 February 2007.